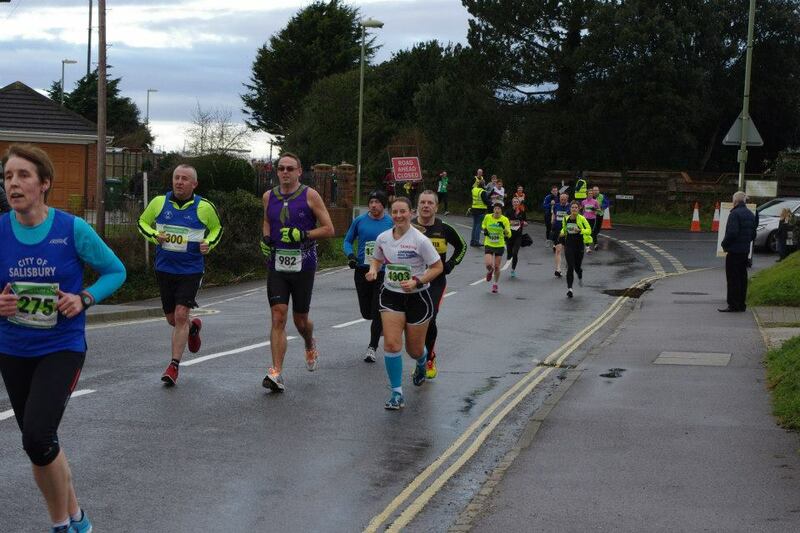 I’ve run Stubbington 3 times before, so I knew what to expect from this race. It’s held on a fairly flat course and being early in the year, the weather can be a bit unpredictable. Two years ago, it snowed during the race (which is unusual for this part of the UK). This year, the weather was fairly cool, but not unbearably cold. 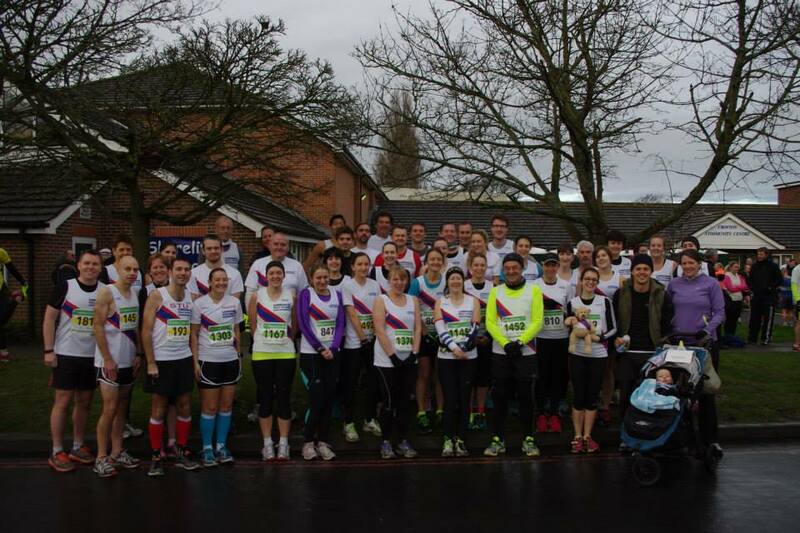 As you can see from the group photo, most of the runners in my club had opted to wear full-length or capri tights and many had long-sleeved base layers under their club vests. I chose to wear calf guards as my legs were a bit achy, but I chose not to wear any other ‘unnecessary’ clothes – no head band, no gloves, no base-layer etc. Fortunately, this was the right decision as I felt really warm by the time I’d run 1km. Stuart, Jez and I arrived quite early, which gave us a chance to chat with lots of other runners. I saw Jan from the tri club and then noticed Steve, one of the tri club coaches. Steve and I had a chat, and I jokingly suggested that I would draft Steve as I had done at the track earlier in the week, but he was starting in an earlier wave than me. I really enjoyed chatting with a few runners who I haven’t seen for a while, but the time passed quickly and before I knew it, it was time to check in my bag and assemble for the group photo. After the photo, I realised that I had checked in my bag, but forgotten to drink anything or put on any lipsyl on. Curses! Emily kindly offered me some lip balm, so that was one problem resolved. We then lined up up on the road ready for the start… and I realised that I had forgotten the most important item in my bag – my inhaler. The last time that I tried to ‘race’ (at parkrun) without an inhaler, I really struggled and had to keep slowing down as I was worried that my wheezing would get worse. I decided to start the race and that if I felt unwell, I would slow down. Despite the asthma worry, I was feeling quite confident about this race. My build up hadn’t been perfect – my eating is not on track, mainly as a consequence of a family situation – but I’m running better than I have since 2012. I knew that beating my Eastleigh times would be hard as Eastleigh is a flatter course, but I wanted to try. One of my worst running habits is to start off far too quickly, so I tried to rein myself in a bit… but I also tend to rely too much on my watch, so I decided that I wouldn’t allow myself to look at it until I was 2km into the race and that it would then only look at it when I saw a km sign. At about 2km into the race, I was passed by Lauren and Alison from my running club. I couldn’t catch up with them, but hoped that I would be able to keep them in sight and thought that maybe I would be able to use my endurance strength to my advantage later in the race. Shortly afterwards, at about 3km, I saw Steve from tri club. He seemed to be running strongly, whereas I was unable to speak. he asked me what happened to my drafting plan, but I was only able to give him a little wave as I went past. I hit 5km in about 26:30. 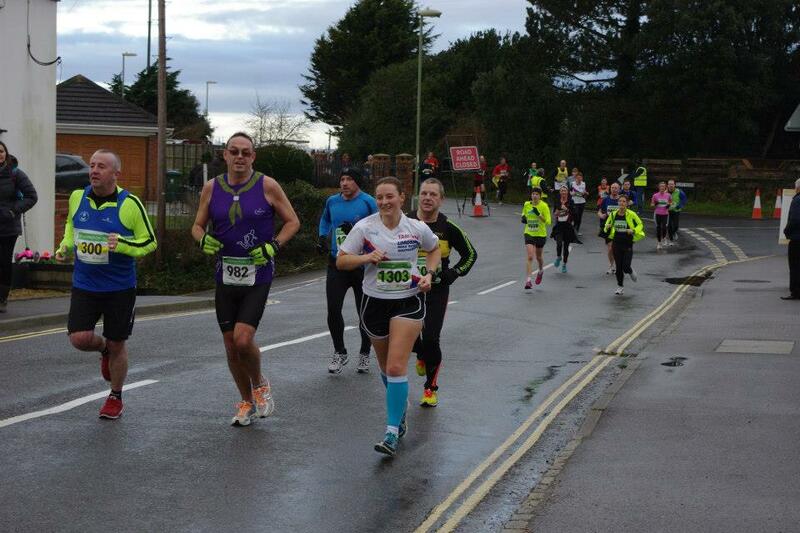 I was disappointed as I think that when I got a PB at Stubbington, I also got a 5km PB. However, I also realised that I was feeling good and I didn’t want to give up too soon, so I pushed on. The race goes along the seafront and afterwards, I was told that there was a good view of the grounded ship (the Hoegh Osaka), but I was so focussed on my race that I didn’t see it. The only thing I noticed was the absence of my favourite race photographer Paul Hammond… but I knew that he’s currently taking photos somewhere more exciting than the South Coast! When I got to the final incline of the race, I was amazed at how good I was feeling. At this point in the race last year, my friend Kate had tried to motivate me to keep up with her, but I had absolutely no strength or energy left. This year, I saw my nemesis (Adrian) from WADAC, so I decided to try to push on and pass him. He said hello (well, actually, he swore a little! ), but wasn’t able to pass me again. The series of photo taken by my club mate Emily show this moment! I didn’t want to be passed again and I knew that I was only a couple of km away from the finish, so I started pushing harder. I didn’t beat my Eastleigh times from 2012 and 2013, but I did beat all of my previous Stubbington times and achieved my third fastest 10km ever 😀 My only other scheduled 10km race for 2015 (so far) is going to be off-road, so it’s not likely to be a PB course, but I’m not too worried about that. I was congratulated by Adrian and as I replied to him, I realised something amazing… I felt OK. For the first time ever at the end of a race, I didn’t feel light-headed and I wasn’t worried that I would faint. This probably doesn’t sound like much, but to me it was amazing. I’ve blacked out a couple of times at the end of races and I usually have to walk around in circles before someone can remove the chip from my ankle. 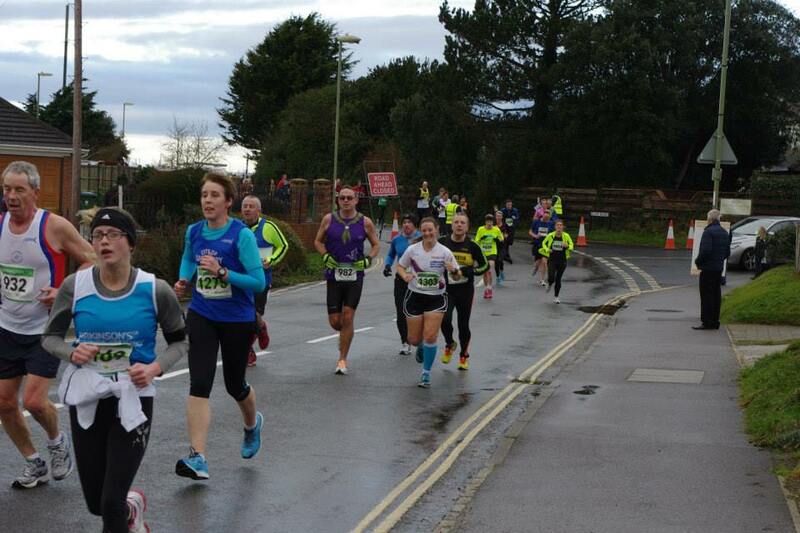 (This race had chips in the bibs, but even so, I wasn’t worried about stopping). I was delighted that I had run well, but to feel that my asthma truly is under control and that it shouldn’t hold me back is so exciting. We were given a commemorative drawstring bag, a banana and a bottle of water. In previous years, we’ve been given a mug and last year we were given buffs, but I’m not really in it for the goodie bag. I have quite a few bags already, but as I often have to carry sports kit to work and lots of my trainers are dirty, another bag is always handy to have. When I got home, I analysed my pacing for the race. As usual, I started too quickly, and then ran the next two kilometres (which were uphill) too slowly to achieve my goal. To get a PB, I needed to average 5:06/km, but I’m not quite there yet. Overall, I think my pacing has improved and although it’s not as consistent as I’d like, once I’d warmed up it was OK. I thought I was flagging in the final km, but the data shows otherwise. A friend is currently running a 1km ‘double negative split challenge’ where the aim is to run 3x1km getting progressively faster. I managed it in kms 5-7 of this race 🙂 I also managed to run a negative split in this race. Success! Finally, I thought I’d share a news item about pacing: Women are better than men at marathon pacing, says new research.